To fully understand the descent into madness, you first have to understand how Tanacon ticketing worked. The event, which promised appearances from names like Bella Thorne, Casey Neistat, Miranda Sings, and Shane Dawson (to those of you just nodding along blankly: famous YouTubers), was technically free. Free tickets to the event went on “sale” in May. They sold out in two minutes. If you didn’t manage to get your hands on one — one vlogger reporting live from the crowd said she never actually spotted anybody wearing a free badge — VIP tickets were available for $65. “But with handling and taxes came to about $77,” Bryan, an 18-year-old Californian, told me. 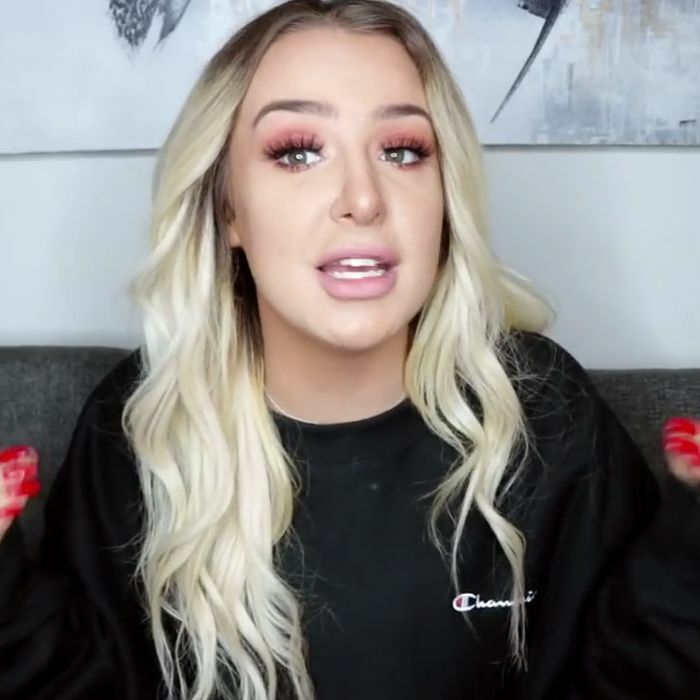 He said that price promised a “concert, gift bags, private signings, and personal pictures.” Once at Tanacon, VIPs discovered the bags contained “just stickers and a condom,” Heidy, 15, noted. Inside the venue, some fans inflated their condoms and passed them through the air like beach balls at a concert. The VIP ticket was also supposed to be a fast pass for meet-and-greet lines. Fans later discovered you had to RSVP online for creator-specific meet-and-greets. Those events had headcount caps, so most fans found themselves locked out anyway. That is the fans who knew that you had to RSVP in the first place. “You only got one [meet-and-greet RSVP] and most of them sold out immediately,” Veronica, an 18-year-old from New Hampshire, said. “They ended up giving everyone at registration the VIP badge because they ran out of the free ticket badges, so almost everyone was a VIP. It was really unorganized,” Devon, a 20-year-old from Orange County, explained. It turns out it didn’t really matter which ticket you had. Once attendees arrived at the venue they were all instructed to stand in the same line, no matter what they had or hadn’t paid. “They said we were going to able to skip front of the line [with VIP],” Devon, a fan who showed up at 6 a.m. to queue, said. “VIPs also stood in the same line as free pass holders … that’s why it took so long.” (Devon was one of the lucky ones who was able to get inside the venue before the whole shebang was shut down.) “I was able to get inside on Friday, but I was first in line and got there at 3:30 a.m.,” another fan, Gianna, said, adding she drove six hours from her hometown, also in California, for Tanacon. For those fans that didn’t arrive in the wee hours of the morning to stand in line, standing in line is basically all that Tanacon amounted to. Even if it wasn’t actually 2o,000 fans, there were still far too many people outside who wanted to get inside. Thus … a whole lot of waiting around in the parking lot. And what happens when you park thousands of people outside for hours in the California sun? They burn. And then they tweet pictures of their burns. On Twitter, attendees also lamented a lack of vendors selling food and water. Fans who managed to get inside were told if they left the venue they would not be allowed back inside. There were no concessions for sale inside the venue, one vlogger explained in a video filmed during the event. Mongeau eventually came outside to calm the crowd. This, reader, will you believe … also did not end well, as evidenced by clips of screaming fans, phones raised above their heads with cameras at the ready, running through the parking lot to spy their queen. “When I went to get my badge, the worker checked my ticket really fast. She didn’t check the name or anything,” Heidy said. “Once I got it, this lady came out and said Tanacon was canceled. Everyone there was mad and they began to freak out.” Another attendee, 16-year-old Camryn from Nevada, described the crowd as an angry mob. “The fire marshal and police came and shut down the whole event,” Camryn said. Mongeau, accompanied by Bella Thorne, told the crowd she and her team —– management company Good Times Live — were getting things figured out for the second day of the event. (She also tweeted that she and her team had located a second venue to fit another 5,000 people on day one. This never materialized.) This, it would later be revealed, didn’t happen. But optimistic fans weren’t given any indication the second day of the convention would also be canceled until the arrived on day two. The next day there was no announcement that day two was canceled “so I showed up at the venue at 7 a.m.,” Camryn said. “There were people gathered in the parking lot where the line was and the employees told us it was canceled. Tana didn’t officially announce the whole event was canceled until hours later.” Good Times Live apologized, via Twitter, on Sunday. Mongeau also posted an apologetic thread offering refunds to everyone who bought a ticket and offering her Gmail address to discuss reparations for any fans who traveled particularly far.